Hundreds of alumni, from the Class of 1949 to the Class of 2016, flooded Miami University for the 2017 Alumni Weekend. Benton Hall hosted classes on Saturday morning in which alumni could learn more about topics of interest. 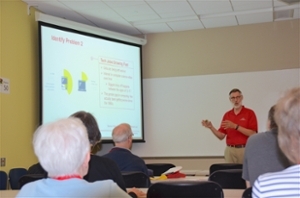 Among the presenters were three CEC faculty and staff members—Jason Berberich, John Richter, and Clark Kelly. 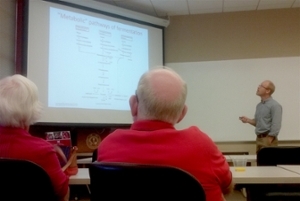 The alumni willing to come to an 8am class on a Saturday could choose to go see Jason Berberich, assistant professor in the chemical, paper & biomedical engineering department, present on fermentation and its uses in the alcohol, food, and pharmaceutical industries. “Fermentation came from us figuring out over time that fermenting prevented things from spoiling,” he said, before going into how many of our favorite foods—cheese, pickles, sausage, bread, and, of course, beer—are created by the fermentation process. He also gave a history lesson on penicillin, and how thousands of scientists worked tirelessly during World War II to figure out how to produce mass quantities of the antibiotic using fermentation. Thanks to this project, which Berberich referred to as “the other Manhattan project”, millions of lives were saved during WWII and beyond. Six Sigma greenbelt certification often leads to better job placement and higher starting salaries for young engineers, and a is a valuable skill for any young professional. 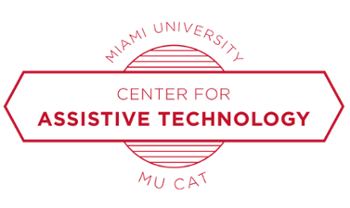 John Richter, clinical faculty member in the mechanical & manufacturing engineering department, has been working to bring this training, which engineers typically receive at the professional level, to the undergraduates here at Miami. 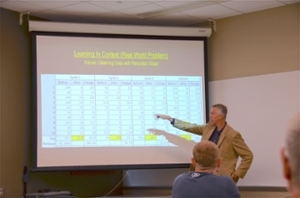 He outlined how students can earn their greenbelt certification, and how the program, which was implemented in the spring 2017 semester, will progress in the following years, including expanding to both working professionals and non-engineering students in 2018.
engineering and computing Clark Kelly, senior director of external communications for CEC, focused on the new direction of the college, where students will not just learn to be technical thinkers but global and socially conscious problem solvers. While the number of engineering grads as a whole has increased in the last ten years, the percentage of women in engineering (20%) has been stagnant. 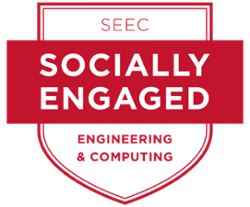 Overall, women generally are not interested in fields without social engagement, even if these fields are higher paying. 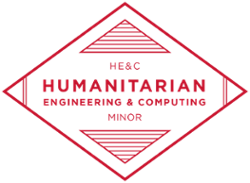 Although engineering and computing are extremely powerful tools to positively change the world, they are not often perceived as such. To change this perception, CEC is introducing a new approach to engineering education, one that emphasizes solving problems, big and small, that make the world a better place. 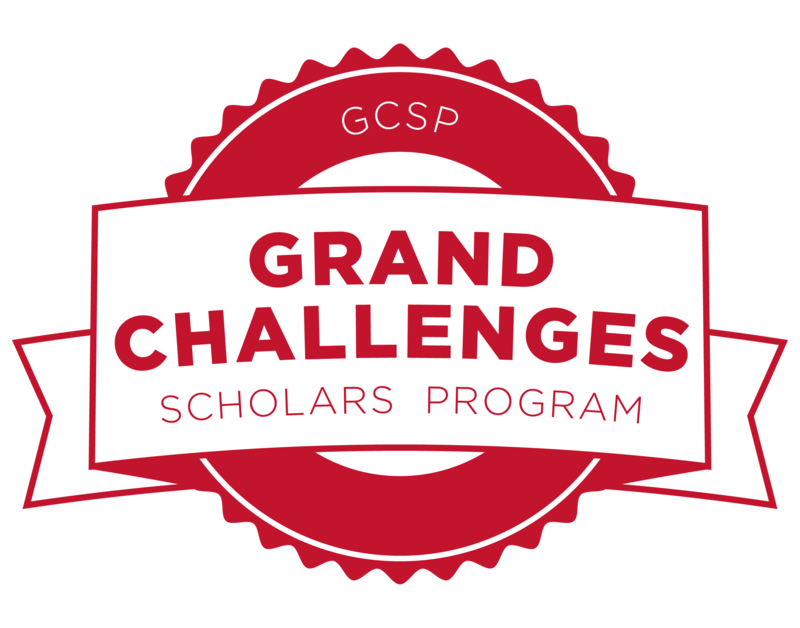 Socially engaged engineering and computing initiatives, which are expected to engage women and the socially-conscious Generation Z as a whole, include the Grand Challenges program, the Center for Assistive Technologies, and the Humanitarian Engineering and Computing minor.